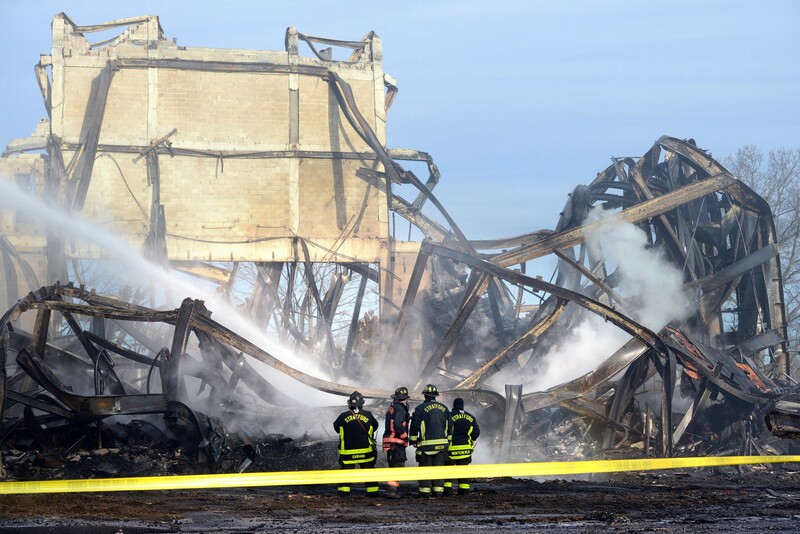 The Shakespeare Theater in Stratford, CT mysteriously burned to the ground on January 13 of this year. It was reported today in The New York Times that a pair of local teens are charged with arson in the case, perhaps having set the blaze as a lark or prank, just as the local community was warming to the idea of activating this hallowed space with more community events. 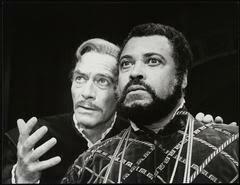 The theater even tried to reinvent itself in 1989 with broader and more contemporary programming. But for some reason it never could financially sustain itself. It was a theater where Katherine Hepburn performed. And where Michael Kahn, long-time leader of Juilliard’s Drama Division and Shakespeare Theatre Company in Washington, DC, did some of his early professional directing. It’s shocking that such a great place ended up abandoned and now destroyed. If Oregon Shakespeare Festival can thrive so in Ashland, Oregon, why couldn’t the American Shakespeare Festival thrive in Stratford, CT? A town founded in 1639 by supposedly friends of Shakespeare’s? It’s a daunting thing to realize how much can be stacked up against a theater’s success, even with all of this rich history in its corner. And how fast a community needs to move in order to successfully reactivate a beloved relic. Recently I’ve been doing a lot of research about Hubbard Hall, as we complete the theater’s first Historic Structure Report, a structural history of the building – with guide posts provided by our preservation architects Lacey Thaler Reilly Wilson for conscientious continued restoration and renovation of the space. And from what I’ve been learning about the history of the Hall, I’m amazed by how quickly the community moved to reactivate the space once it was again noticed. Hubbard Hall’s first era of vibrant programming ran from 1878 until 1927. Then the Hall sat mostly idle for almost fifty years. One significant difference with Stratford, though, is that the ground floor stores in the Hall stayed active even when the upstairs Hall was not, keeping the building occupied and fairly secure. But by 1976 the owners Dorothy and Andrew Bell let it be known that they would be willing to sell the building for the bargain price of $20,000. That very same year, Benjie and Cynthia White, along with David Owen and a cadre of other community members, began hosting events in the Hall to show its viability and gain momentum for the necessary fundraising to purchase the building. See the Washington County Post article below. In less than a year they raised what they needed and purchased the building in January 1978. Immediately they began renovations AND programming, simultaneously, at first programming a cafe space they outfitted in the basement called “Under the Bell Tower.” Then they quickly ran forward with plans, more fundraising, and LOTS of volunteer labor. They spoke to anyone who would listen about Hubbard Hall and its future. They pushed their passions in the community and lit people up with excitement. They launched a new era of activity that has now culminated in more than 41 years of great work on stage, in the dance studio and throughout our region, along with thousands of paying jobs and millions of dollars generated for our local community. They manifested their dream into a better reality for everyone. It took a long time – but they moved quickly. And that’s what strikes me about the Stratford case. Any time one of our cultural assets sits idle, we need to act – and act quickly. And when a community decides that saving a space is worth it, it needs to move immediately and not let decades or even months pass by without action. Otherwise a couple teenagers can get in and turn our dreams into a nightmare. I’m heartened by the fact that, even as this story is reported today, dozens of teenagers are in Hubbard Hall, performing a hit run of the musical Annie. Instead of burning us down, they’re building us up, and we them. As I say to my arts administration students, part of any arts organization’s litmus test for relevance should be: if you were on fire, who would come running to help? 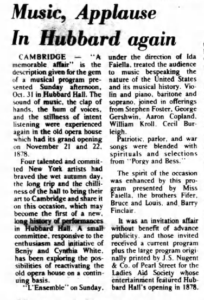 On Thursday, Nov 4, 1976, the WCP shared the news that music had returned to Hubbard Hall for the first time in decades. CAMBRIDGE — “A memorable affair” is the description given for the gem of a musical program presented Sunday afternoon, Oct. 31 in Hubbard Half. The sound of musk, the clap of hands, the hum of voices, and the stillness of intent listening were experienced again in the old opera house which had its grand opening on November 21 and 22, 1878. Four talented and committed New York artists had braved the wet autumn day, the long trip and the chilliness of the hall to bring their art to Cambridge and snare it on this occasion, which may become the first of a new, long history of performances in Hubbard Hall. 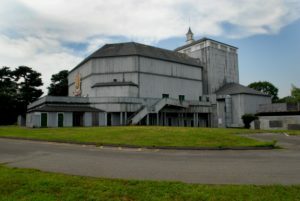 A small committee, responsive to the enthusiasm and initiative of Benjy and Cynthia White, has been exploring the possibilities of reactivating the old opera house on a continuing basis. “L’Ensemble” on Sunday, under the direction of Ida Faiella. treated the audience to music bespeaking the nature of the United States and its musical history. Violin and piano, baritone and soprano, joined in offerings from Stephen Foster, George Gershwin, Aaron Copland, William Kroll, Cecil Burleigh. Patriotic, parlor, and war songs were blended with spirituals and selections from “Porgy and Bess. The spirit of the occasion was enhanced by this program presented by Miss Faiella. the brothers Fifer, Bruce and Louis, and. Barry Finclair.